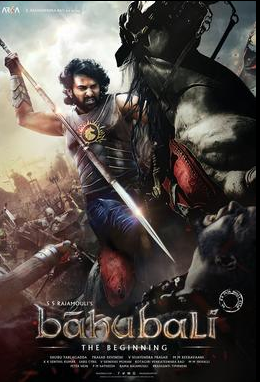 Baahubali: The Beginning is an Indian epic historical fiction film released in year 2015, directed by S. S. Rajamouli. The film was produced by Prasad Devineni and Shobu Yarlagadda, the first of its two cinematic parts were shot in Tamil and Telugu. This film includes Rana Daggubati, Prabhas, Tamannaah and Anushka Shetty in lead roles. The film features Sathyaraj, Nassar, Ramya Krishnan, Adivi Sesh, Tanikella Bharani and Sudeep in supporting roles. The film was produced on a budget of ₹ 120 crore and was released worldwide on 10 July 2015. It gained positive reviews from censors, turning out as the highest grossing Indian film within country-India. On the box office The film collected around ₹302 at the box office. The movie has a IMDB rating of 8.3 out of 10.